I love how many Italian holidays seems to feature a lasagne somewhere in Italy. This lasagne from Naples is made during carnival. 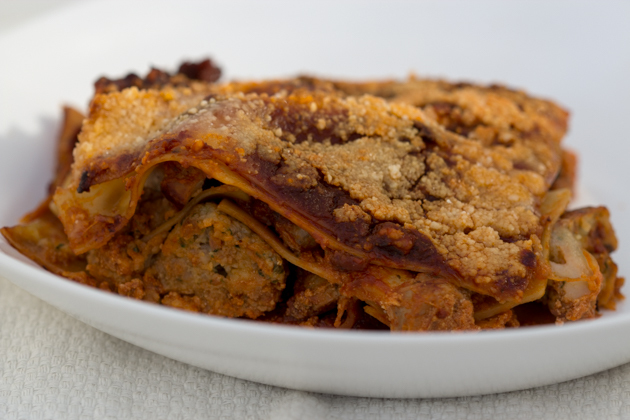 It is a rich dish comprised of layered meatballs, Neapolitan meat sauce (prepared for the quintessential Sunday family meal), sausages, ricotta, Parmigiano-Reggiano, mozzarella, hard-boiled eggs (optional) and pasta sheets; the perfect dish for the aptly named Martedi Grasso (fat Tuesday). This dish embodies the sentiment of Carnival, when the Winter ends and the Spring (and the feasting to invoke good luck) begins. This is all in anticipation of 40 days of fasting for Lent. I suggest you also celebrate the end of Winter by enjoying this lasagne…..but skip the fasting. For more about the tradition of carnival in Italy, click here. For step-by-step illustrated instructions, click here. In a large frying pan, add 20 mls olive oil and the sausages and heat over medium heat. Cook, turning until evenly browned all over. Add the white wine and cook until the wine is reduced by half. Slice the sausages and add to the meat sauce. To make the meatballs, soak the bread in water for a couple of minutes. Squeeze the excess water out of the bread and mix with the minced pork, 5 grams of the Parmigiano-Reggiano cheese, parsley, egg and salt and pepper to taste. When well mixed, wet your hands and start rolling 2 cm diameter meatballs. Heat a large frying pan with 60 mls olive oil and fry the meatballs, turning to evenly brown. When the meatballs are browned, add them to the meat sauce. Bring the meat sauce to a boil over medium heat and then turn off the heat. Preheat the oven to 160C. Remove 120 mls of the meat sauce and mix with the ricotta to make a thick cream. Cook the lasagne sheets in a large pot filled with 6 litres of boiling water with 60 grams of salt and 5 mls of olive oil. Remove the lasagne sheets to cool on tea towels. Reserve a third of the remaining meat sauce (without the meat in it) and Parmigiano-Reggiano. In a 24 cm long baking dish that is at least 7 cm tall, begin layering the meat sauce, lasagne sheets, ricotta, Parmigiano-Reggiano, mozzarella, meatballs and sausage. Make at least three layers of pasta and top with the reserved meat sauce and Parmigiano-Reggiano. Bake the lasagne for 30 minutes until all the cheese is melted.